After listening to the album Question of Balance in the early 1970s, Kevin became absorbed with their timeless, melodic, uplifting, Symphonic Rock Music and their lyrics of Peace, Love and Harmony. After listening to more of their current albums at the time he became more aware of the Mellotron sound and how atmospheric and futuristic it sounded. It sounded magical along with the haunting flute playing. Martin Smith (Streetly Electronics), All Things Mellotronic 2006. 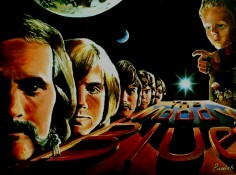 “Kevin Parrish’s Moody Blues Art captures, in my opinion, many aspects of the musical journey of the band.